The Military Macaw is a large macaw with a black beak, about 70cm in length. Its plumage is largely brilliant green, with a red patch at the front of the head, more red and blue on the tail, and blue flight feathers, giving it an impressively colourful appearance. There are several named races; A.m. militaris, A.m. mexicana, which is a little larger, and A.m. boliviana, which has a red-brown throat and darker blue tips on the tail and wing feathers. 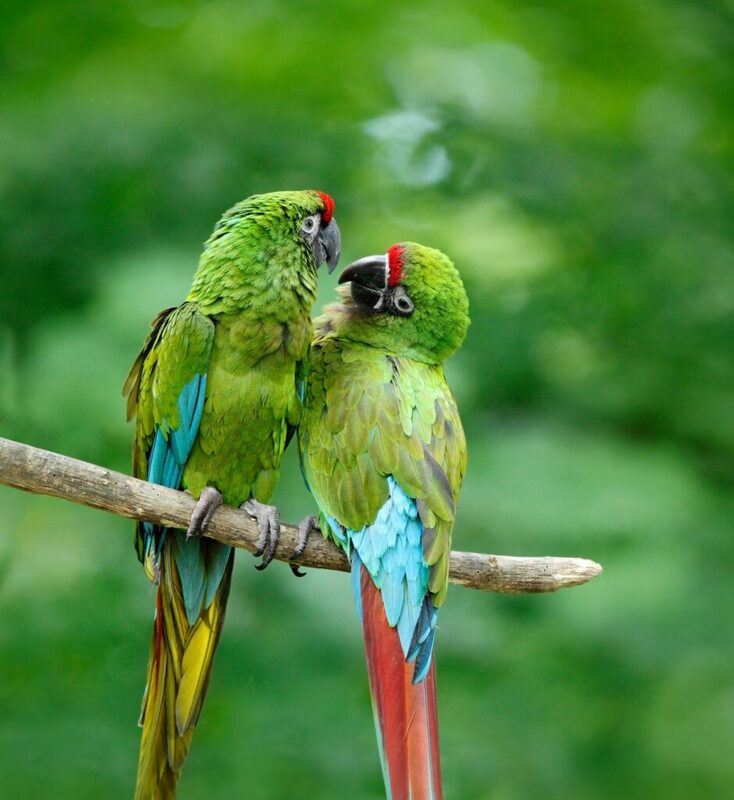 These birds are also very similar in appearance to the Great Green Macaw. Military Macaws have large communal roosts, very often on cliff faces. They are noisy birds, giving loud creaking calls and shrieking cries. They forage in pairs or groups of up to 10 individuals, and feed largely on fruit and nuts. Nests are built in cliff cavities or in tree holes, with the preference varying across different parts of the macaw’s range. They lay two or three eggs, and in Mexico, the breeding season falls in June. The Military Macaw occurs from Mexico as far south as Argentina, but its range is very fragmented and in South America consists of a series of scattered populations along the length of the Andes. There are former range areas in western Mexico where it is now extinct. 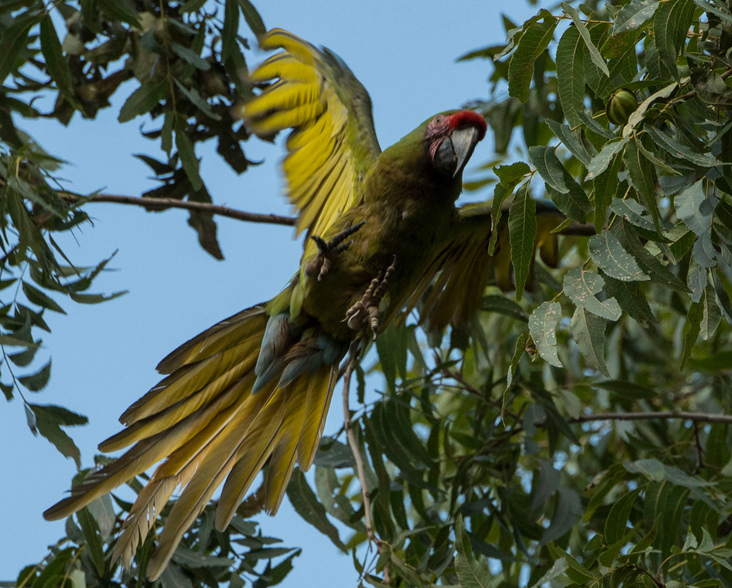 In South America, these macaws prefer wooded mountain foothills with humid forest and canyons, while in Mexico, they use a slightly wider range of habitat types, including semi-arid woodland and pine-oak forest. They do not seem to be restricted to pristine habitat, with reports from Peru and Mexico that they will use shade-grown coffee plantations and other agricultural land. The IUCN judges that the Military Macaw is Vulnerable, and there is some lack of clarity on the likely overall population size of this species, with estimates made in 2016 ranging from as low as 1,000 breeding pairs to as high as 10,000 individual birds. There are two main threats to the species, as it is trapped at high levels for the pet trade as well as being affected by habitat loss. Where the macaws nest in tree cavities, these nests are very vulnerable to poaching. It was estimated in 2002 that 23 per cent of suitable habitat in Mexico had been lost, and only a small proportion of the species’ range in Mexico falls within a protected area, though the population in the Sierra Gorda Biosphere Reserve is thought to be reasonably viable. As it uses agricultural land, it may also be persecuted as a pest in these areas.